I haven’t seen this work in person but I hope to one day. I love flat paintings + drawings and this sculpture plays with flatness in a whole new way. It is made out of welded steel and stands 15 meters high. 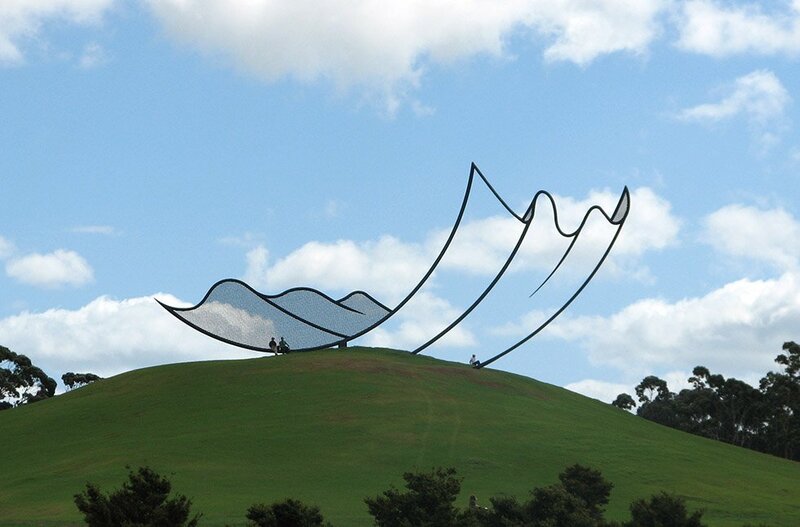 Neil Dawson (1948-) is a well known New Zealand sculptor and is best known for his large civic works crafted from stainless steel and aluminium. You can see more of Neil’s works on his site. This work lives at Gibbs Farm also known as “The Farm” in Makarau, a 50 minute drive north of Auckland, New Zealand. Alan Gibbs bought the property in 1991 and decided to commission artworks to display on his farm, turning it into a beautiful outdoor gallery.